With Gliding Action! Everyone has a different take on Jesus. Muslims and Jews saw him as a prophet; Buddhists say he was enlightened; Hindus consider him an avatar (the incarnation of a deity in human form) while Christians hail him as the Son of God. But, wherever your theological compass points, you will agree that this is the coolest action figure since G.I. Joe. 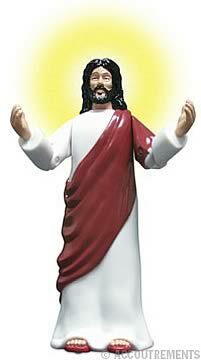 Each hard plastic Jesus Action Figure stands 5-inches tall with poseable arms to reach toward the heavens and wheels in his base for smooth gliding action. Comes in a illustrated clamshell package with biblical quotes on the back. The name Jesus means "God Saves". The term Christ is a title for "Anointed of God". Jesus was an extraordinary healer. Nearly a quarter of the Gospels describe his powers over sickness. To the downtrodden, he taught restraint and charity in the face of oppression. As a result, the powerless learned to maintain dignity without being arrogant. He delivered this message to the people: "The time has arrived for God's will to be done on earth as it is in Heaven If you believe in this good news, then it will happen". He was executed at a young age as a common criminal. Since the, he has been the topic of many heated theological debates. Although he is understood in many ways, everyone seems to agree that he was a remarkable man.